Congratulations to the following winners of the Austin 60 Strong contest who were selected by a panel of luminary judges. To learn more about the 60 Strong Ambassadors click on their name below, or click here for more information. 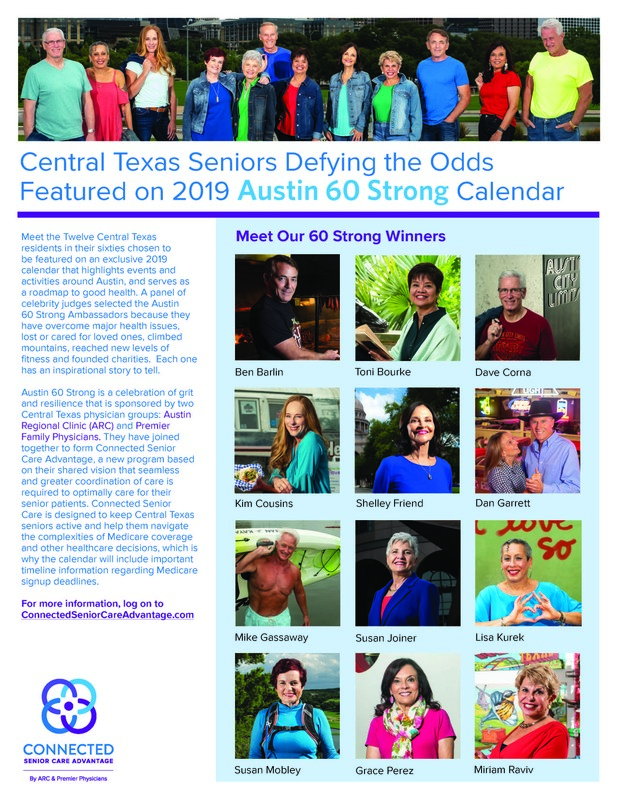 The winners will be featured on the Austin 60 Strong 2019 Calendar, which highlights Central Texas landmarks, events and activities. The 60 Strong Ambassadors have accomplished unimaginable feats; overcome chronic health conditions; changed lives for those less fortunate; and contributed to society in a meaningful way. The 2019 Calendar will also include health tips for seniors. Proceeds from calendar sales will benefit Capital City Village, a nonprofit program for aging seniors that allows them to be cared for at home and in their communities.